Incidentally whilst writing I’ve been moving some of my canoes, ready for displaying a few, and it reminded me to try and find out a bit more about one which I’m very uncertain about. This is an Inuit style kayak, made from birchbark, over an inuit style frame -ever heard or seen such a kayak? I’m looking after it for the BCU, and am not sure if its aboriginal or a UK craft enthusiast playing. The BCU certainly don’t know and its source passed away a few years ago. About your Inuit-style kayak made of birchbark, I’m intrigued. The only thing that comes remotely close to what you describe is a Gwichin-style canoe from the Mackenzie River delta, of which we have a couple. Do these look in any way like relatives of what you’re holding? The answer from Graham was no and, in reply, he sent a set of pictures to help illustrate what he was talking about (see gallery above). Graham! I think you’ve unearthed the missing link! What an interesting hybrid of design ideas and construction techniques. The skin doesn’t look like Betula papyrifera but that’s a bit of a moot issue at this point. I’ve never seen a bark-covered kayak and what a weird and wonderful mix of what looks like hand-hewn members, small branches, and dimensional lumber, all strung together with what looks like some kind of jute cordage, babiche? and pitch. The deck and chine external battens are a distinctive wrinkle as well. I’m cc’ing our Curator, Jeremy Ward as well as our friend and Royal Ontario Museum Curator, Ken Lister, to see if this rings an bells with them. In your earlier note you said that you’re minding this beauty for the BCU and, somewhere along the way, its provenance has gone astray. Of the two possibilities you propose, looking at this picture I’d head more toward the “UK craft enthusiast playing” rathter than “aboriginal” origin at this point. But it’s certainly a generative and multi-layered assemblage of stuff and human ingenuity. Thanks for sending along the pix. To my eyes, the skin does appear to be a cloth-resin mix and, at first blush, I would agree with James’ comment about it being a UK enthusiast’s effort. I’d be curious to know if the skin was actually seamed at those black lines as it appears. If so, are they sewn? What’s most striking is the absence of fore-and-aft hull stringers between the skin and ribbing. Sealskin would show the shape of these ribs without the stringers, resembling the bellows of an accordion. Birchbark, without the support of longitudinal support against the pressure of ribs, would be break. I can only imagine that this boat has a cloth/resin skin but look forward to Ken’s thoughts also. It is an interesting blending/improvisation of both kayak styles and also construction details. This is definitely a craft that celebrates the creative mind and proves diffusion and migration theories. First, it looks to me (although I am not totally sure) that the rib ends are sandwiched between inner and outer gunwales like in canoe construction. Kayak ribs tended to be mortised into the bottom edges of the gunwales. 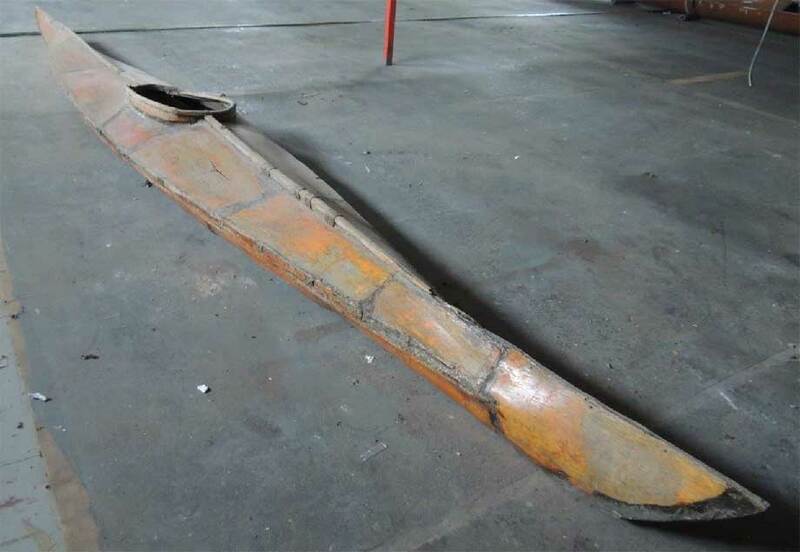 If this is correct it would appear that the maker initially built a canoe hull, albeit rather shallow. 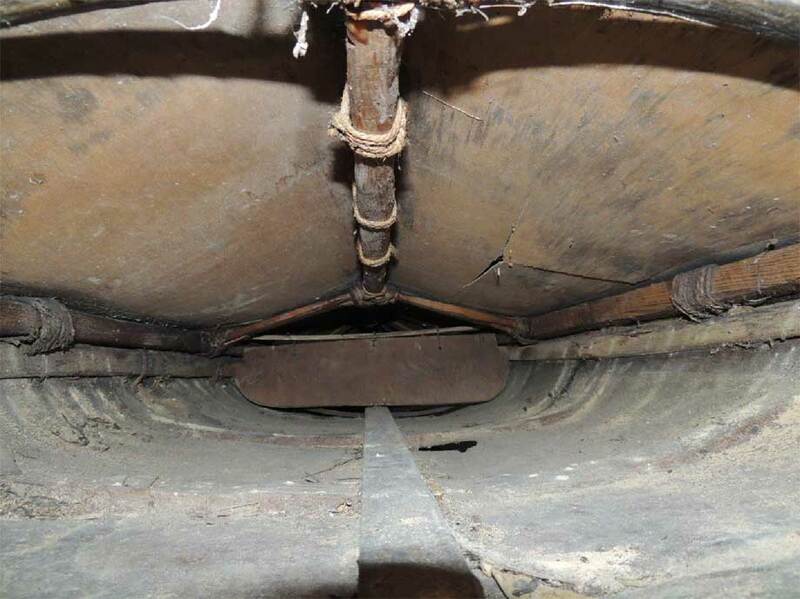 Then another wood member was attached to the gunwales and the upper part of the vessel was tied into them. On this basis alone, I think we can safely say that this vessel is not Native made. 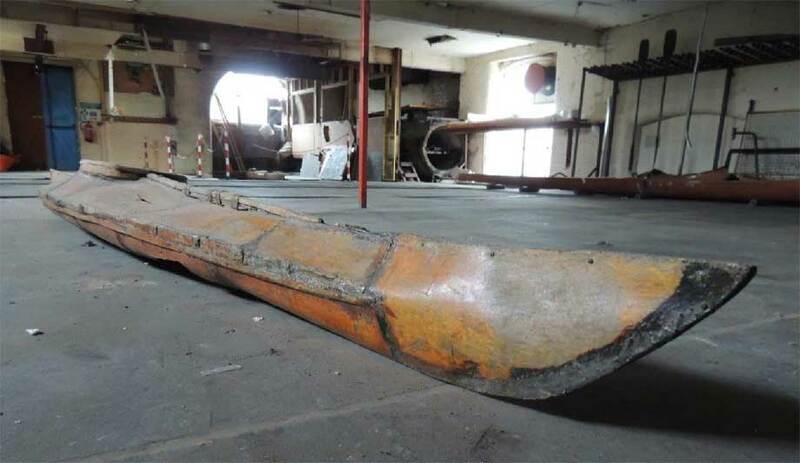 However, the maker was certainly well aware of kayak construction in that the coaming appears to be “floating.” That is the outer “skin” wraps underneath the coaming and is secured to the coaming’s inner face. 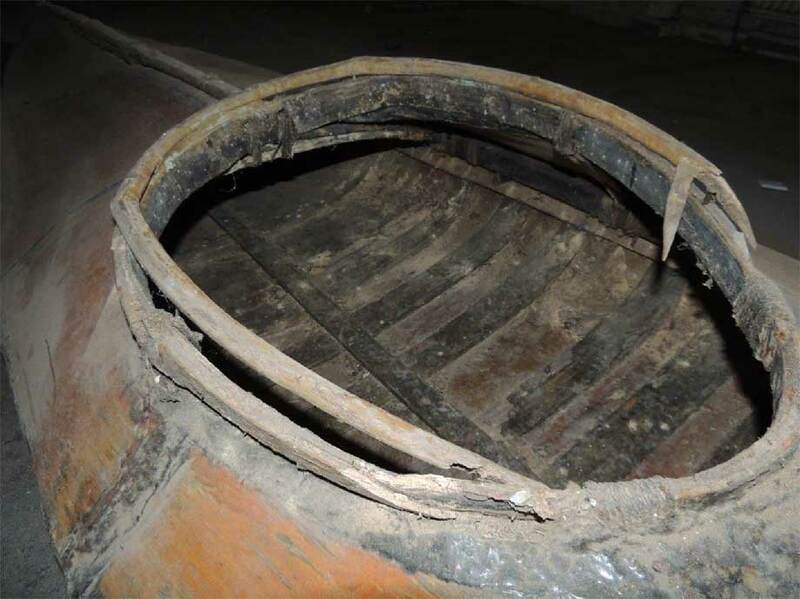 Thus, the coaming is held by the skin and not directly attached to the frame. This construction technique is characteristic of virtually all Inuit kayaks north and east of the Bering Strait. On the other hand, the ridged deck is a characteristic of the west Alaskan kayak with the Canadian and Greenland kayaks having flattened decks with the exception of the bow rise to the coaming. 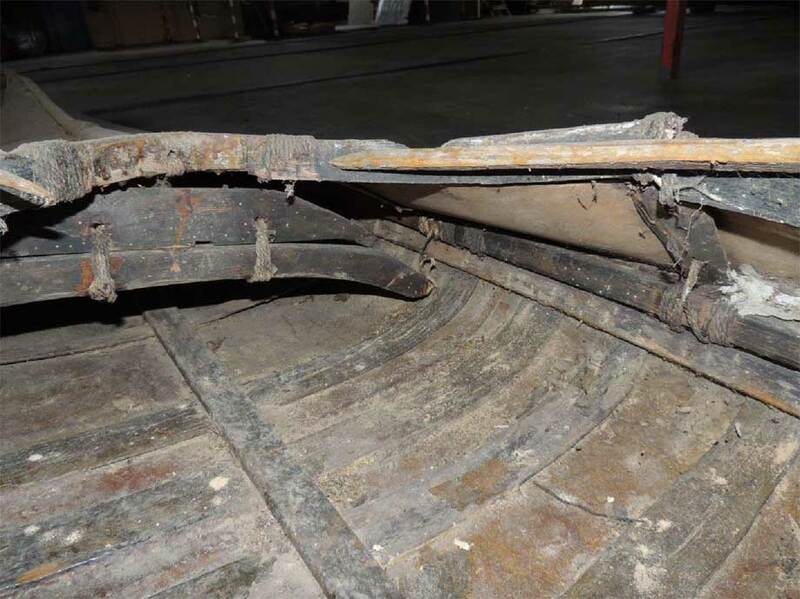 Indeed the sharp rise on the beam of the side decks to the coaming is what one would see with kayaks from the Bering Sea although the way in which the coaming is secured is a more northern and eastern characteristic. Cloth as a covering certainly was used by the Inuit and by at least 1950 the Inuit of Pond Inlet were covering their kayak frames with canvas and painted to provide waterproofing. F. Nansen, in the early 1890s for his push to the north pole, was perhaps the first European to adopt the Inuit kayak design . His kayak frame was made of bamboo and covered with sail canvas. 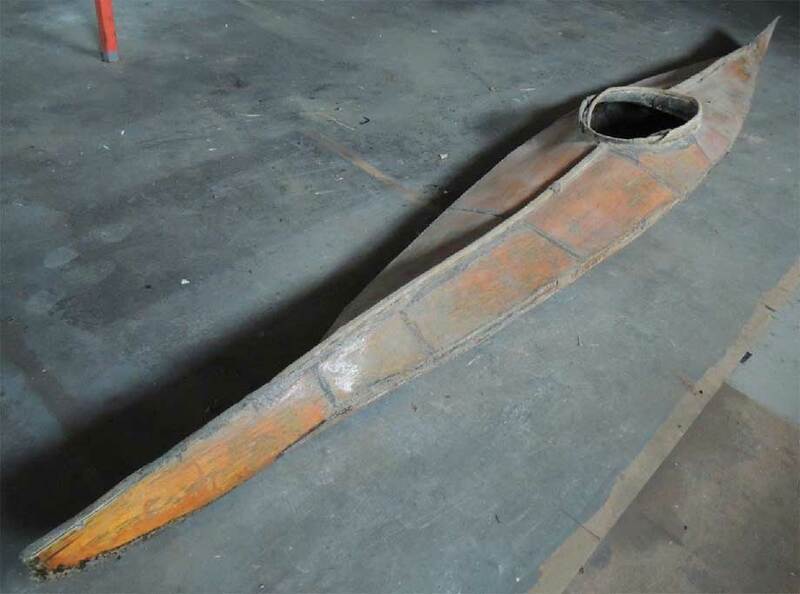 I would tend to agree that this vessel is the result of a very creative and skilled non-Native mind and one that had a general idea of kayak design along with some knowledge of kayak construction details. As James mentions, it seems to be a hybrid of characteristics that includes canoe and both eastern and western kayak features. Thank you for bringing this kayak to my attention. It reminds me a little bit of the Piltdown Man with the exception that this one is actually real and quite serviceable. The eyes have it, gentlemen. What an absolute treat it has been to participate this curatorial go-round. Thank you Graham for starting the journey Jeremy and Ken, privileged to see what you see in these pictures. Collectively we round the circle come back to where the quest began and suddenly the skip is robbed of an aged hulk. Put this baby up in lights, Graham, and let’s make a date to sit around it and consider it further in your old canal warehouse. Reading a new book Fun! p. 78 “My morning studio listening at the time was CBC Radio, specifically Peter Gzowski’s show Morningside … the guest talked about the sea hunting prowess of the Thule, made possible by an extraordinary list of clever tools and devices, chief among them the sea kayak. [Listeners] were reminded that the boat was all the more impressive for being fashioned out of a frozen land wehere nothing grows above one’s knee. The Thule’s unique sea-hunting technologies were homegrown and developed with few or no outside influences. either they had no contact with tundra Indians to the south or they simply saw their own technologies as superior. Towards the end of the interview, the guest said that the Thule’s fashioning form an apparently “empty” land a kayak seaworthy enough to paddle the dangerous and unpredictable Arctic Ocean was an amazing accomplishment. Furthermore, he added, their mastry in successfully hunting huge sea mammals, including 70-ton bowhead whales, was considered by many anthropologists to the “apex of human endeavour.” (from The Memory of Water, Wildred Laurier University Press, 2013). The apex of human endeavour! That’s what we’ve been talking about, n’est ce pas??? I forwarded this chatter and pics over to a colleague in Boston for his thoughts. Vernon is certainly much more aware of 20th century kayak building trends and succession than I. Interesting to imagine this as a stitch and glue hull with darts taken out of the veneer skin rather than the usual longitudinal seam construction. Therein lies the birchbark similarities by the vertical seams. Check out the westcoastpaddler link – it’s worth a look to see this boat, not by its shape but by method, as part of a continuum. Memory twitches. There was a chap in UK who used two sheets of thin marine ply to build a kayak shape a bit like this. The sheets were 4ft x 8ft so the loa was 16 feet. This is not it but the overall shape is similar. There was a firm ‘Avoncraft’ I knew the owner quite well, his name escapes me just now. Originally he offered kits of thin ply to schools, scouts, etc with the loan of a jig on which to build it. ! Ah gottit, Bob Vardy. (Google Avon Craft Robert Vardy Ltd ) The business is current. The kayak was about 16 ft long with frames at (?) 3 ft intervals. Each frame received a narrow strip around it, 2mm birch ply, so that the edges of the strip extended beyond the edge of the frame. The frames were rigged on a spine. Thin ply was bent round each pair of frames, glued and stapled to the strips on the frames. The thin 1.5mm birch ply was originally used to build ‘Mosquito’ twin motor fighter bombers over a balsa wood sandwich. Beautiful aircraft , fast and deadly. I think Bob lived near where they were built. I have an ace B&W video of Mossies being built in OZ. I could sketch the method. I digress. What reminds me of that is the inside view of the cockpit of the mystery craft, the thin flat transverse strips look like the strips that were fitted to the Bob Vardy kayak jig. Also the sections between the black seals at roughly 3ft intervals on the mystery craft look as if this one was built on a Bob Vardy type jig. The Vardy kayak shell was given a skin of aircraft quality woven glass and resined down. The whole assembly was very lightweight. My guess is the mystery craft was built by someone who knew the Bob Vardy method. Mine had no gunwale line, it was one smooth curve. It was light, very strong. It was called “Byde’s Persian Slipper” or “The Capsize trainer”.Paddle in a straight line and it was easy. Start to turn either way and the water surged over the rear deck and oops! Over they went. It was a one off. Imagination suggests that whoever built this kayak may have seen what I did at Durham, School. Very many thanks for your very considered opinions, and a considerable increase in my education. I esp like the analogy with Piltdown Man. Now I know for certain it is from my side of the pond, I’m left with the significant question of why? I was thinking if it proved to be British origin it would be destined for the skip, I now think that there is fun to be had with my fellow Brits. For your interest I’m refurbishing the upper floor of our old (1820) canal warehouse building that Pyranha has used since ’79, to expand a shop, and use the opportunity to display a few of Pyranha’s, the BCU’s and my historic kayaks and canoes. It won’t be a museum as such as it needs to pay its way, but I do hope to increase interest over here in the hope that eventually we might have our own Museum in Britain. I’ll send you some photos when it’s done. How’s that for a very cool example of people working collectively at a distance to explore a problem!?! I realise this stream is probably closed but my memory has been stirred – I came upon this forum while browsing Granta Boats, Ottersports, Ken Littledyke etc. I am in the UK. I built some Kayel stich-and-glue kayaks, first a Kayel Slalom (as a young man at college late 60’s) and in the late 80’s two mini versions for my mini kids. I had fancied building the Kayel Angmasalik but life got in the way, the kayak which is quite like the photo that started this stream. The two Cub kayaks became a catamaran. What grabbed me though was Alan Byde’s references. Bob Vardy was just starting out Avoncraft I suspect in the late 60’s – I went with the Hatfield College gym supervisor to meet Bob Vardy at his house in (I think) Berkhampstead to look at his GRP kayak. The college subsequently bought some. This was before plastic canoes. Nearby Hatfield was also the home of De Havilland aircraft company who had made the Mosquito during WW2 using the balsa and ply Alan mentions. I was apprenticed there and one of my mentors had helped to design it. (The prototype had been built at nearby Salisbury Hall (where Winston Churchill had lived) to escape detection from German bombing raids). The nice thing about the Kayel kits from Granta Boats was the pre-formed cockpit edging, steamed or jig-laminated I imagine. When I made my mini copies for the kids I was able to purchase this one tricky component. Granta had been bought by Ottersports by then, in the 80’s. Chris, I’d be interested to know more of the histories of Ottersports, Granta etc. I lived in Northampton in the 70s when Ottersports were still going and while there I bought a secondhand Tourer (£7.00 !!) which I still have. Was this a Ken Littledyke design and do you know if anyone still has design rights ?